Yay, the pictures are in! Click here for a sneak peek from Kendall’s blog. My goodness, we’ve been busy! 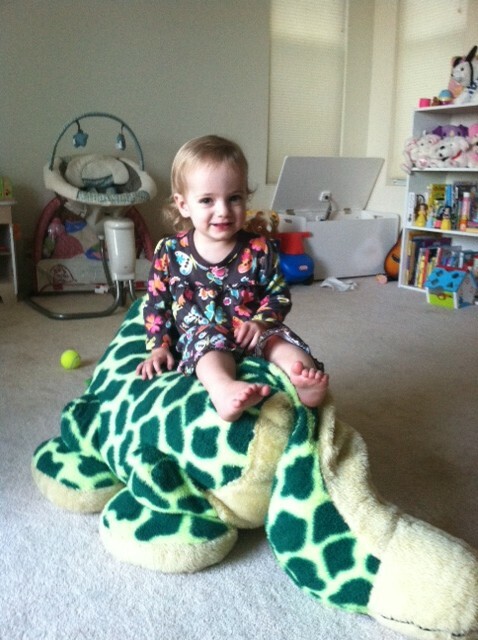 I don’t think there’s ever a dull moment with an 18-month-old. At least not with ours. Our weekends have been packed since the last time I posted…barbecues with friends, baby shower for my co-worker, even a little “sprinkle” for the boy. 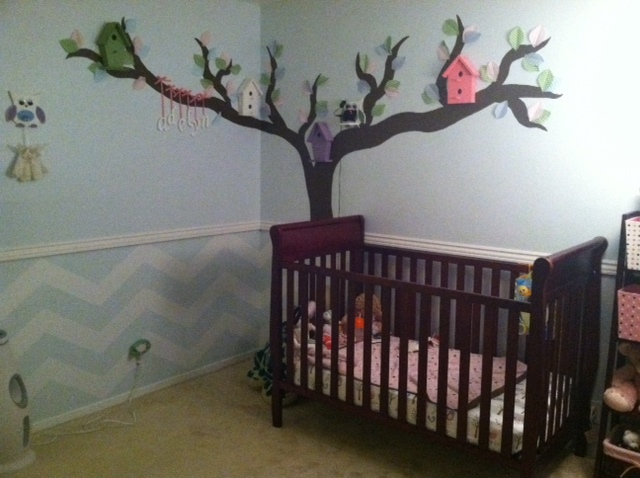 All this while trying to paint two nurseries (Addie has to move rooms so this little one can be close to our room, so we’re working on painting the tree – for the third time! 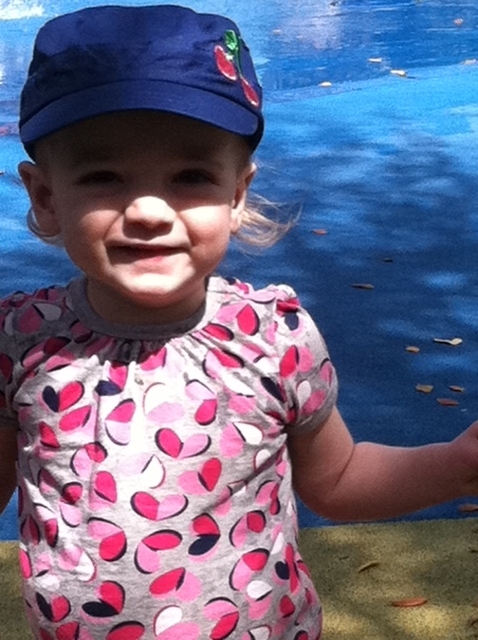 ), and let Addie experience all the fun things there are to do in Reno during the summer! 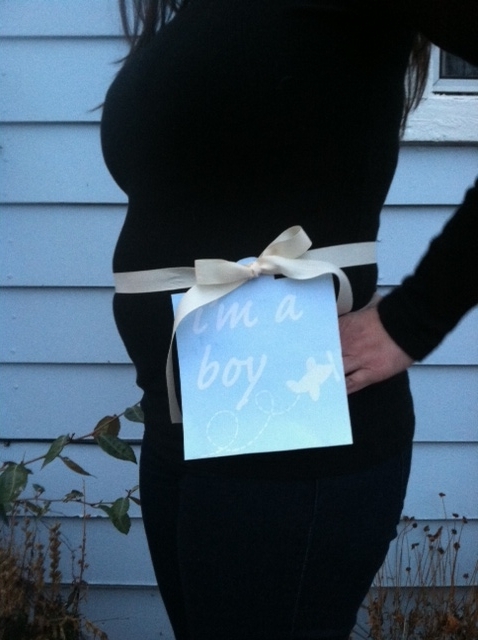 It really is the best time of year here – though being 34 weeks pregnant makes me not want to spend much time outdoors. Regardless, I endured the 95+ degree heat this weekend so we could fill our days with good food, horses, and a relaxing father’s day at the pool! Friday after work, we contemplated the rodeo, but Jimmy got distracted by the sign twirler on his way home and we ended up at the farmers’ market. 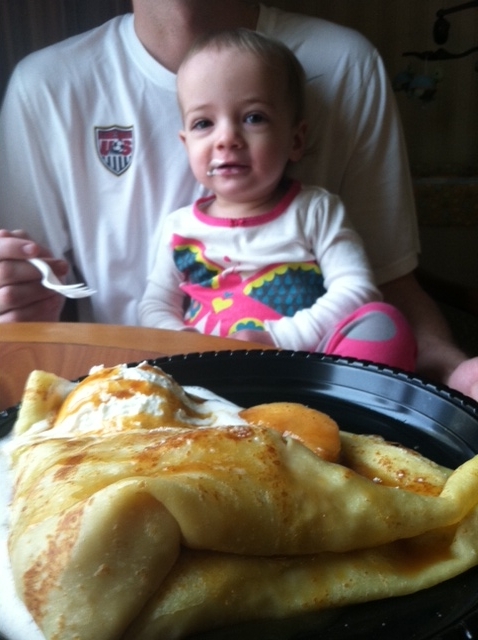 I think Addie approved of the choice! This market is a bit different, it’s at a plant nursery and behind it is a huge pasture. Addie made friends with the goats and donkeys on our way in. Then, she got to stuff her face with a ridiculous amount of fruit and french fries. 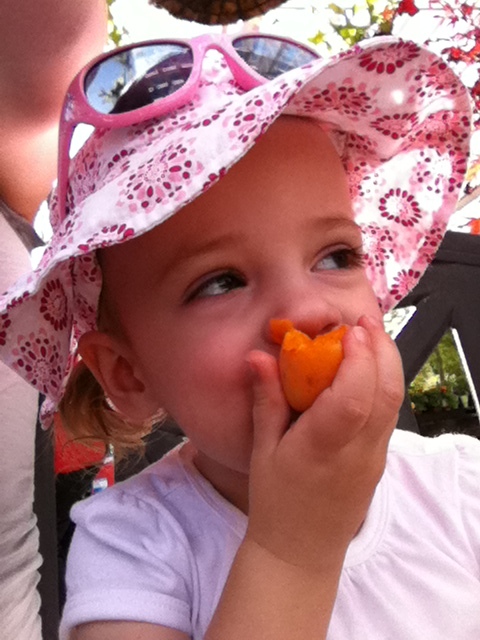 She had three apricots and would have finished the whole bag had we not distract her (with more food, of course), but she was still asking for another “orange” on our way out. We finally got her mind off of it by filling her up with frozen yogurt. 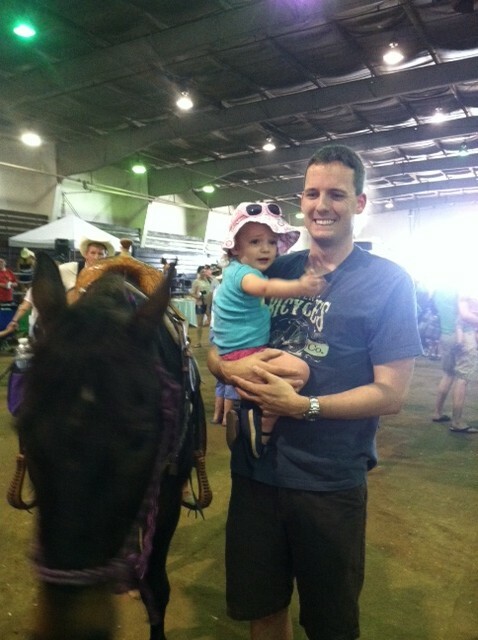 After seeing her love of the animals at the market, we decided to check out the free kid’s activities on Saturday at the rodeo. 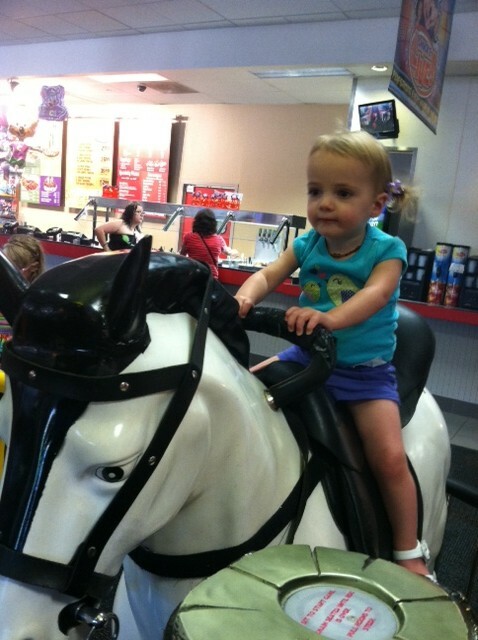 We weren’t sure what to expect, but we hoped there would be some animals to entertain Addie. I think she was a little young to really enjoy herself and she wasn’t too keen on the horses walking around. I think they may have been too big. She didn’t mind them from a distance, but we tried to let her pet one and she wasn’t having it! 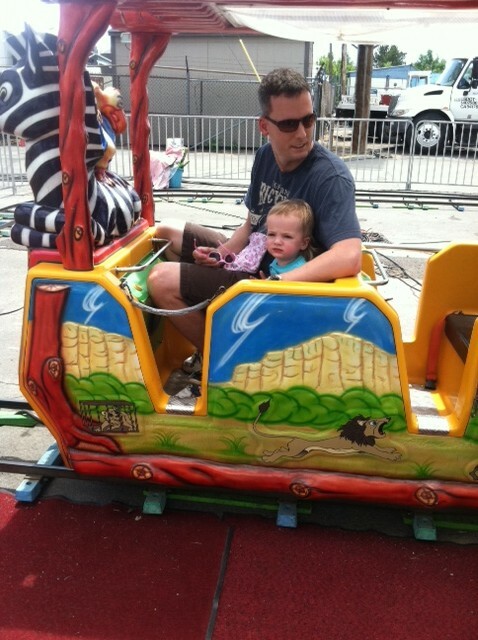 She did get to experience her first carnival ride though. 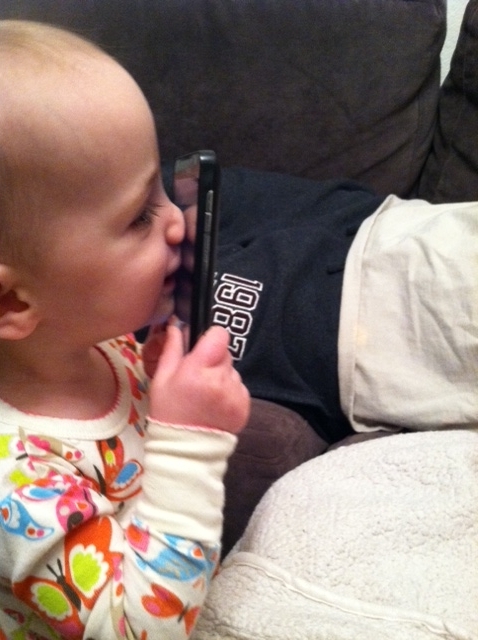 I don’t think she or her daddy found it to be overly exciting. It didn’t do much, just went around in circles, but we thought, at the least, she’d enjoy the zebra on the front of her car. Not so much. After that we gave up on the rodeo and went to lunch instead. She was much happier! 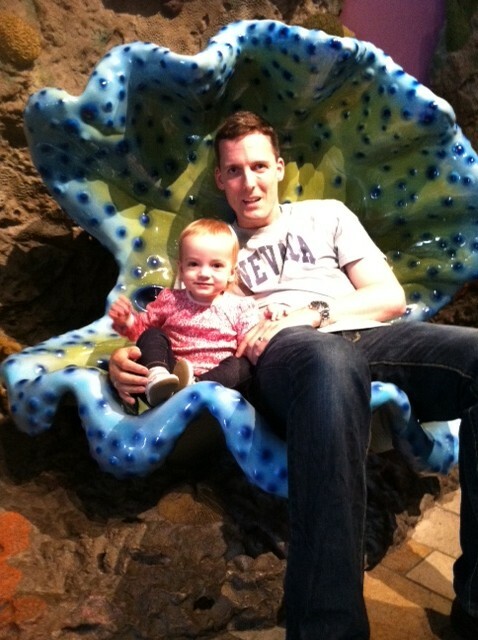 In honor of Addie’s amazing daddy, we spent a nice, relaxing father’s day at home. Jimmy mowed the lawn, so I guess there was a low point, but the rest of the day was Daddy/Addie time well spent wrestling, reading books, and swimming at our community pool. 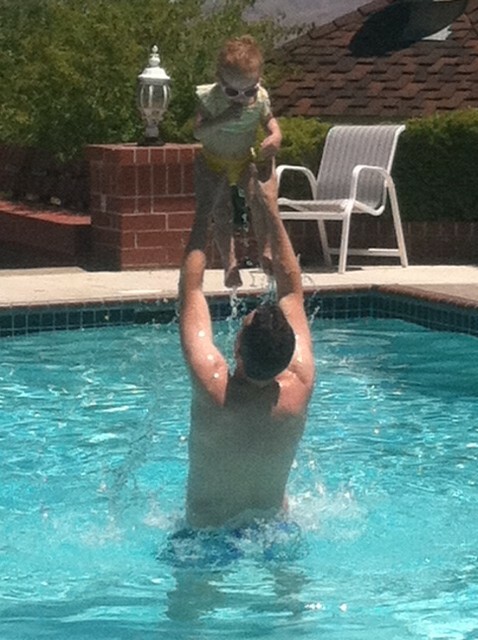 Addie loves the water! 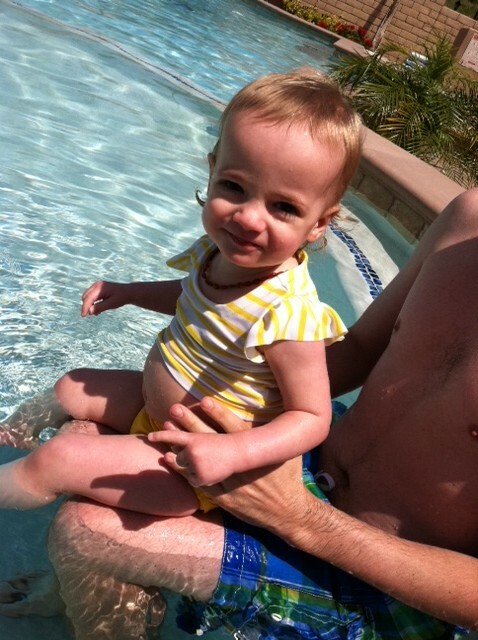 We start swimming lessons again next week, so we’re hoping she’ll like it even more as the summer goes on. We had my family over for a nice dinner, then spent the next hour laughing at the crazy things Addie does after getting hopped up on chocolate cake. She was certainly in rare form and crashed hard after everyone left. I can’t imagine the chaos in our future with two! Speaking of the boy, below is one more belly picture. 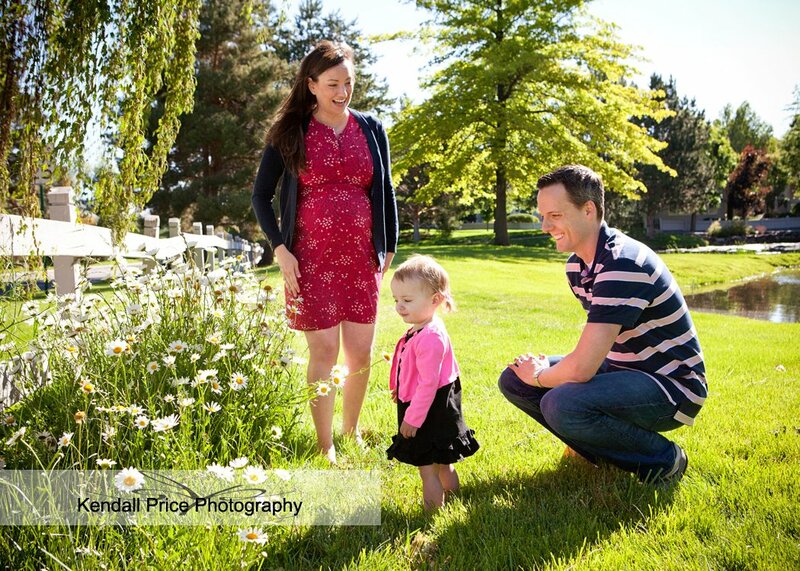 Last weekend, we did maternity/family pictures with Kendall – we’re trying our hardest to stay on top of documenting this one, but time just slips away from us while running after Addie! 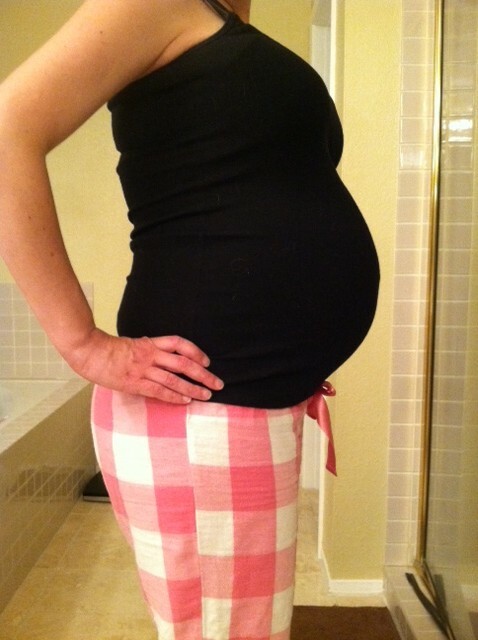 So, the picture here is from 30 weeks, and Kendall’s will be at 33 weeks. We’re at 34 today, so I’ll try to remember to get a couple more between now and his birthday. Yesterday, I thought, six more weeks, that’s plenty of time. But this morning, when I thought, we’re at 5 weeks and some odd days, I felt a little panic come over me. Five weeks is nothing! And we still have so much to do before he comes! I don’t remember feeling stressed about Addie. I’m sure that whole getting my master’s degree thing helped to distract me in the end. Once I get these rooms done, I’m sure I’ll feel much better. Wish me luck!! After traveling up and down the California coast for 10 days, we’re happy to be back home in our own cozy beds! 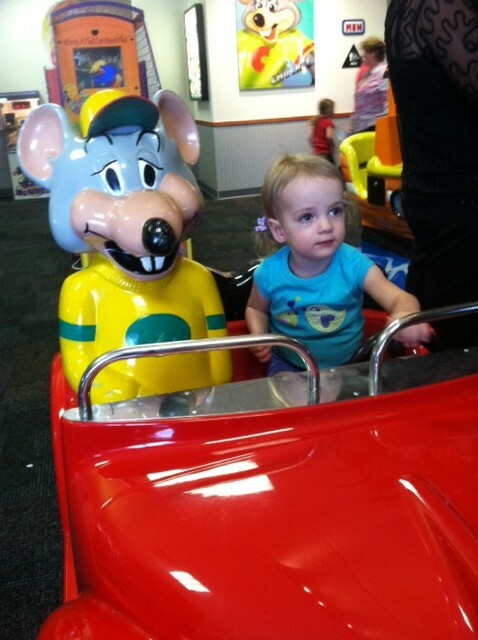 We had such a fun time and Addie was an amazing road tripper. We started off with a quick over-nighter in El Dorado Hills. Then, bright and early the next morning, we hit the long stretch of I-5 to Los Angeles. The stinky and over-crowded cattle farms on that road make me sick, but it was all for a good cause. We got to spend a few days with my dearest friend, Gina and her sweet husband, Sunil. 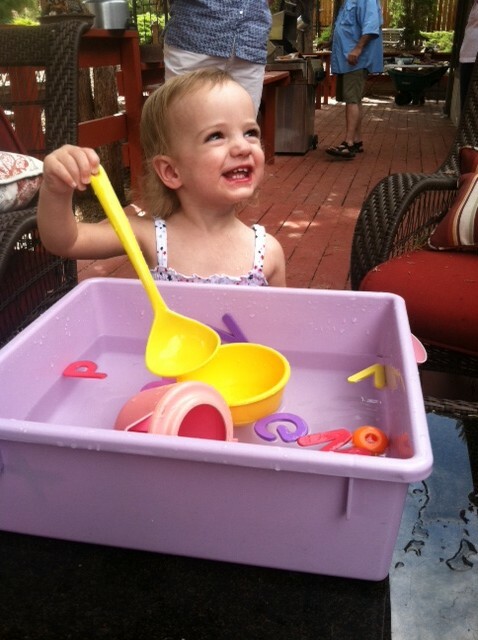 Addie had so much fun at their house and even though her teeth were chattering and lips were turning blue, she could have stayed in their pool all day! That Monday morning (April 30th, the best day of the year, our 7-year anniversary!!! ), we packed up again and headed up the coast to Monterey. The drive was beautiful though we spent half of it in a cloud of fog. Luckily Addie slept for most of the drive and when she wasn’t sleeping we could keep her happy by feeding her veggie chips, her latest obsession. It was early evening by the time we settled in to our hotel room, so we headed to the wharf for dinner. 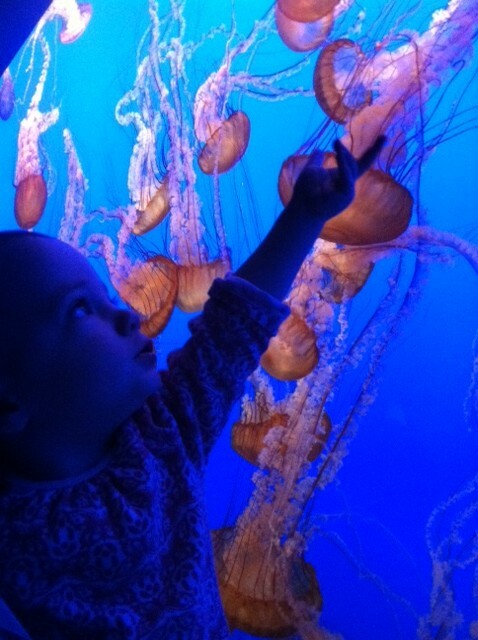 We spent the next two days playing at the aquarium and soaking up the fresh ocean air at a local farmers’ market. 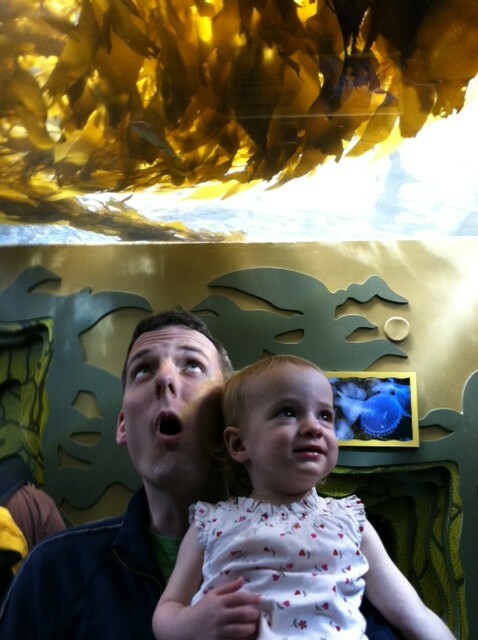 We visited the aquarium during Addie’s nap time, so she wasn’t as excited as I expected, but she still had a great time. 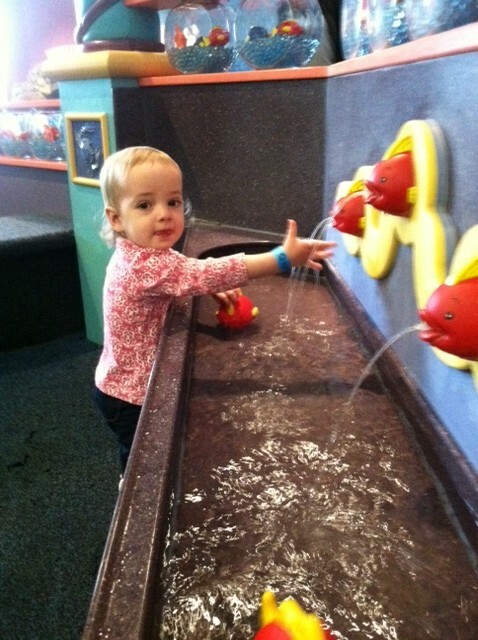 Her favorite part was this little water pool with floating fish that they had in a toddler play area. 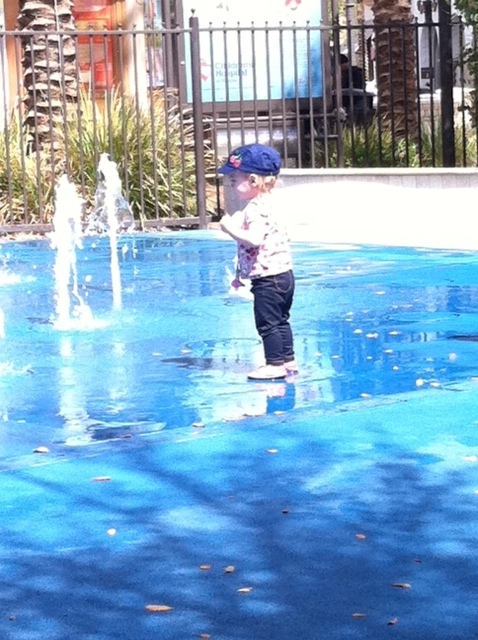 She seriously could have stayed there all day and didn’t mind in the least that her shirt was soaked by the end. 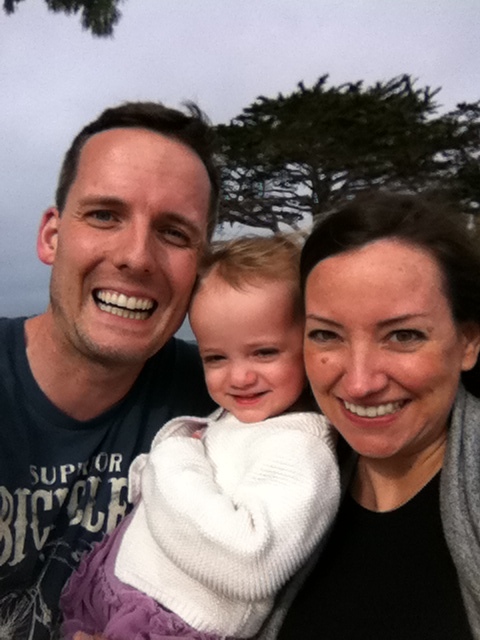 After our Monterey adventures, we headed back to El Dorado Hills. 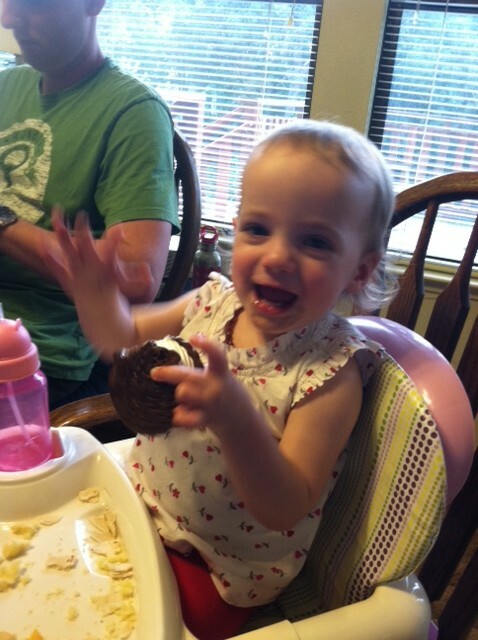 Addie had a great time with Nana & Poppy and even got to visit with RJ and Sharon for a little while. Nana was kind enough to let her have a giant ice cream sandwich for dessert, though it was so big that she only finished half before giving the sloppy mess to mom. She and RJ played soccer in the living room and while it took a while for her to warm up to Sharon (she still remembers and unfortunate peek-a-boo experience), she was willing to give her hugs and kisses before heading off to bed for the night. 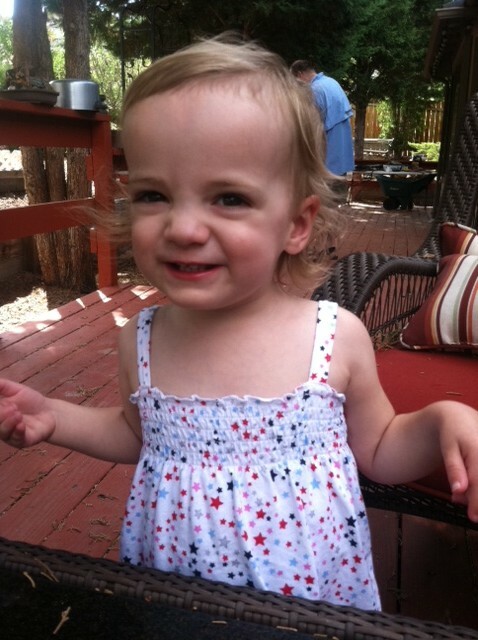 We spent most of Thursday at Nana & Poppy’s before heading to our last road trip destination – Lake Tahoe! Our wonderful friends, Lesley & Paul were married in the most amazing church in Squaw Valley. The weather was just perfect and the whole day was absolutely beautiful, just as expected. I managed to not take a single picture at the wedding, I’m terrible, I know, but I did manage to get this cute shot of Jimmy & Addie the first night we got there. We had the greatest time spending the whole week with Addie and not thinking about work! I wish we were still on vacation, but it’s so nice to be back in Reno in the comfort of our own home. And I think the pugs and kitties are glad we’re back too! 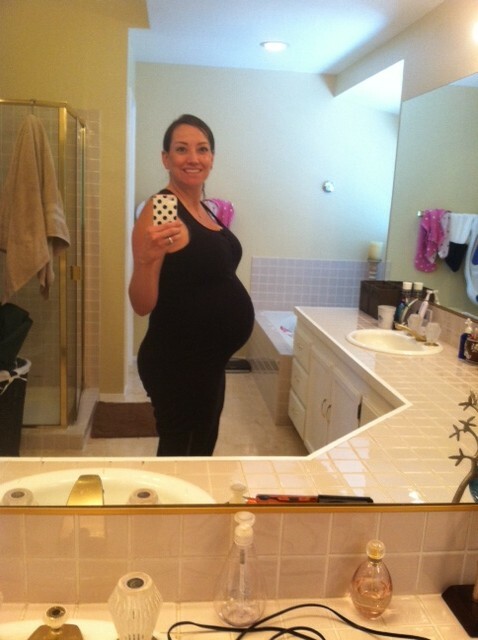 In baby G2 news, we’re officially in our 3rd trimester. I know, I can’t believe it either! This has gone way too fast and we are so unprepared! We have big plans to spend the next few weekends painting, moving rooms around, and hopefully buying lots of stuff to prepare for July. 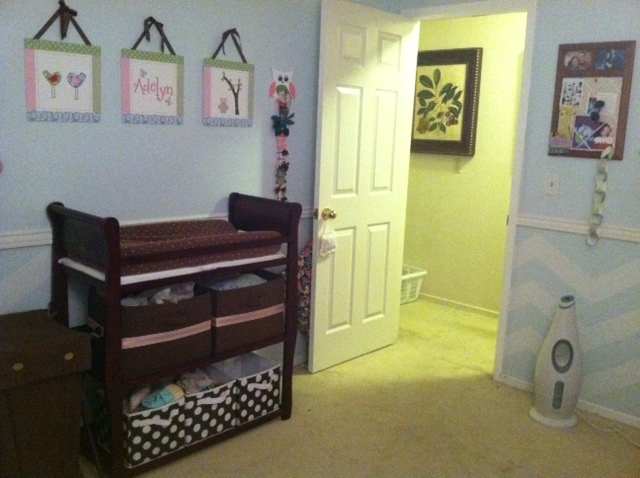 I’ve heard way too many stories lately of babies coming early, so I’m feeling a bit stressed to get a nursery in order. Though I guess Addie didn’t really have one until she was 6 weeks old! I know we’ll manage just fine, but if we could get some things done before, I’d feel a lot more prepared to be a mom of two! Here’s the picture I promised you a while ago. I think it’s somewhere between 25-26 weeks. Addie had the best Valentine’s Day! 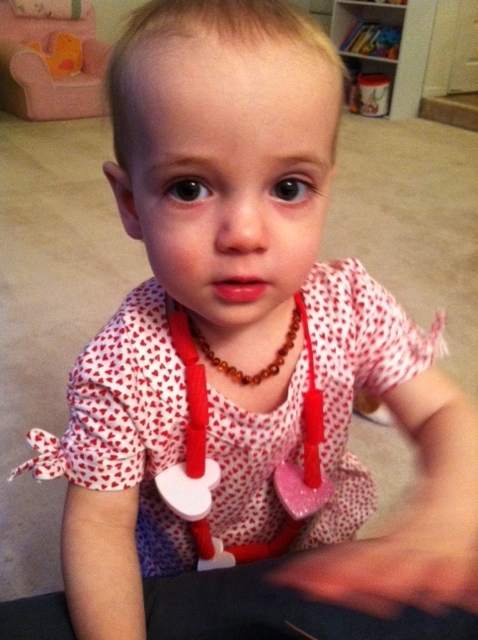 She was certainly dressed for the occasion this year and when I picked her up from daycare, she was even cuter with a handmade necklace of red noodles and hearts! I just love our sitter! She had a delicious dinner – actually two dinners – her usual spread of corn, peas, blueberries and a huge bowl of beans and cheese, then enjoyed about half of what was on Jimmy’s dinner plate, fish and parsnip mashed potatoes. After about an hour of rolling around on the couch, her new favorite activity, she crashed hard in her crib! Such a great day spent with the ones I love most! A few weeks back, we spent a weekend in Tahoe for Vic’s 50th birthday. Krista and her brood came up too, so we had quite a full house! 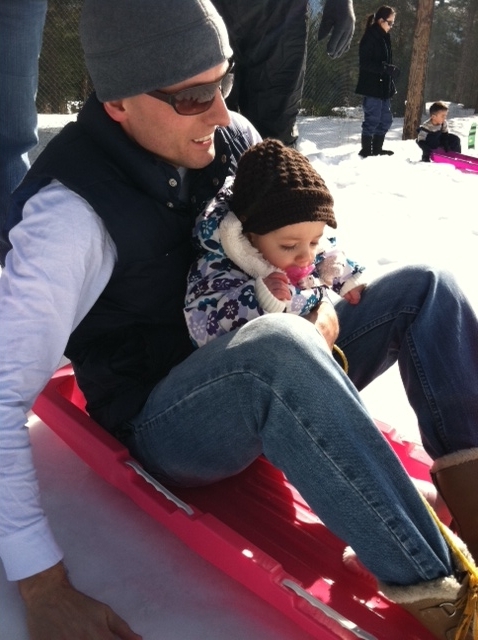 Addie enjoyed her first snowy adventure…sledding! 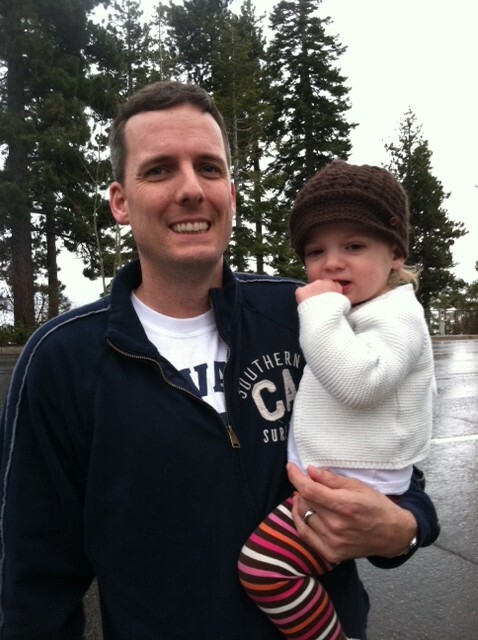 She loved going down the hill with her Daddy. 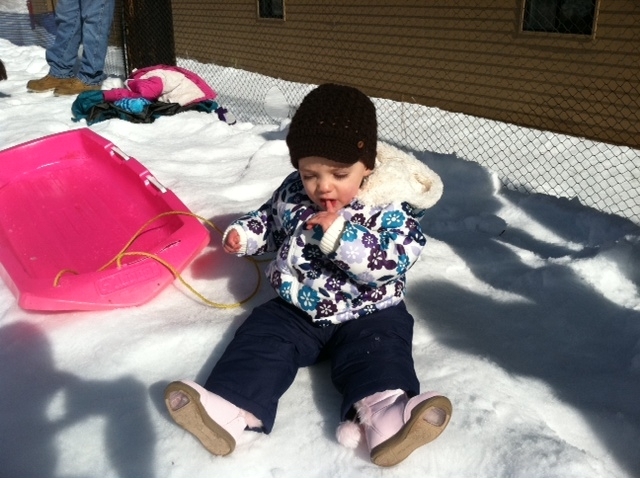 And, maybe even cooler than sledding, eating the snow! I swear, she spent a half hour straight just sitting eating chunks of snow. In other exciting news, Addie’s going to have a sibling in July! We’re thrilled, but each day, something happens that makes me think, “How on earth do we do this with two?” Thank goodness Addie is such a great kid! I think she’ll be the best big sister ever. I think this picture was 12 weeks. We have an 8 week somewhere, but with all our photo devices, I can’t remember where it is! 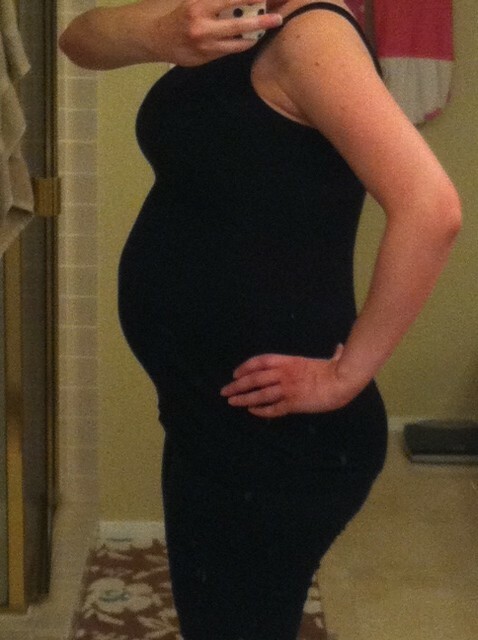 Baby G2 is definitely showing sooner than I did with Addie. 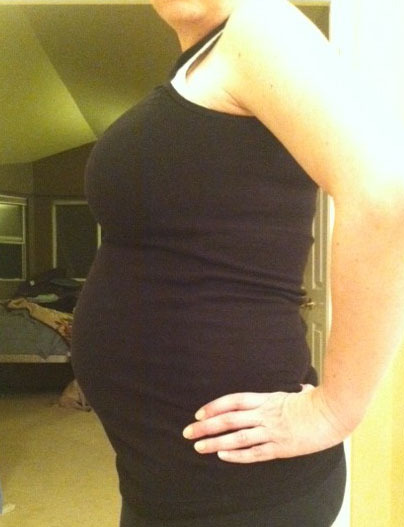 New 16 week picture to come later this week – though I think I’m 17 weeks already?? We have our “20 week” ultrasound schedule for March 19, so maybe at that point we’ll get a firm due date and I can really know how far along we are. I’m guessing 22 at that point, but we’ll see!